This recipe is quick and great for a party appetizer. Since sweet potatoes are in season, I had a few on hand and thought I'd use em up. You could totally make this a vegetarian meal by omitting the turkey bacon. I love how cute this little appetizer is lol. Pre-heat your oven to 375 degrees/ Combine all of the dry ingredients in a bowl. Next add the mashed sweet potato to a deep mixing bowl. Next add in the eggs, butter and green onions. Combine all of the wet ingredients, before adding in the dry ingredients. Once all of the ingredients are in the same bowl, combine well, making sure to scrape the sides and bottom of the bowl. Spray a cookie sheet with cooking spray and place a dollop of the mix onto the surface of the cookie sheet- it should look like the size of a lemon (in diameter). Flatten them down a little with your spatula and bake for 25-30 minutes. Add the corn, tomatoes, black beans, onions, garlic and green onions into a bowl. Cook the bacon in the oven at 400 degrees until it is crispy. Slice the bacon into thin pieces and add to the bowl. Next add in the lime juice, olive oil, black pepper, cumin and salt and combine every thing well. Combine all of the ingredients well. Making sure to remove any lumps- you want a velvety smooth cream. 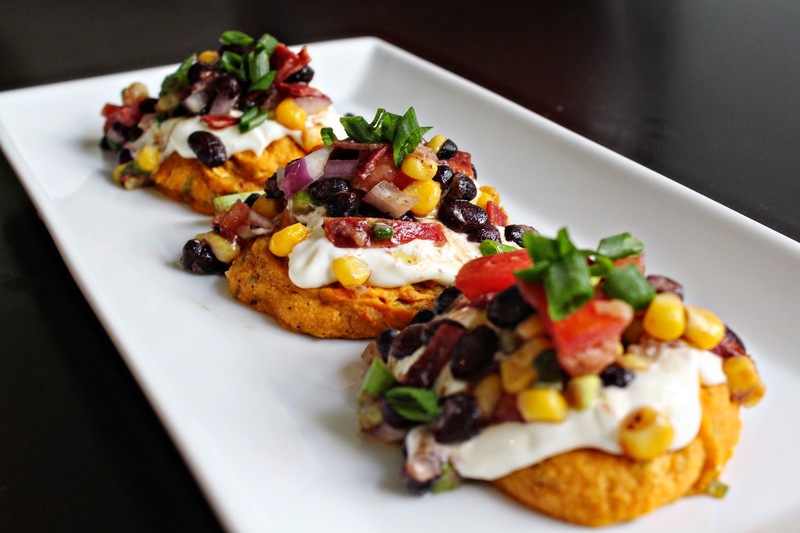 Assemble by placing a sweet potato cake down on a serving dish. Next spoon a dollop of the sauce, followed by a scoop of the salsa. Garnish with some sliced green onions. Oh these look delicious, Roxanne. I can't eat them for a while but I'm definitely looking forward to trying them. Love the combination of flavors here girl. These cakes look irresistable. These look delicious and can't wait to make them. One question, are the sweet potatoes raw or cooked before putting them in the oven?